For others, see Freaky Friday (disambiguation). 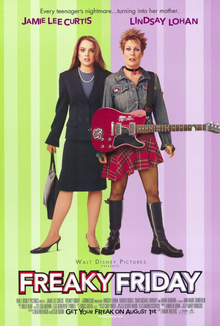 Freaky Friday is a 2003 American fantasy comedy film directed by Mark Waters and written by Heather Hach and Leslie Dixon, based on Mary Rodgers’ 1972 novel of the same name. It stars Jamie Lee Curtis and Lindsay Lohan as a mother and daughter, whose bodies are switched due to a mysterious and magical fortune cookie. The film was released in theaters on August 6, 2003, by Walt Disney Pictures and Buena Vista Pictures. It received positive reviews from film critics and it earned over $160 million worldwide on a $20 million budget. It was Disney's third film adaptation of the novel, after the film Freaky Friday (1976), starring Barbara Harris and Jodie Foster, and the television film Freaky Friday (1995), starring Shelley Long and Gaby Hoffmann. It was released on VHS and DVD on December 16, 2003, by Walt Disney Home Entertainment. Anna Coleman (Lindsay Lohan) is an average teenager and aspiring musician who lives with her widowed mother, Tess (Jamie Lee Curtis), and younger brother, Harry. Tess is about to be married to her fiancé Ryan Volvo, which Anna has not entirely accepted. Anna's band, Pink Slip is scheduled to audition for a gig at the House of Blues. Anna's English teacher, Mr. Bates, unfairly gives her "F"s on her assignments and Tess disapproves of Anna's crush on older student Jake. Anna gets detention twice during one school day: once for talking back to Mr. Bates, and again for intentionally hitting her nemesis Stacey Hinkhouse in the head with a volleyball during gym class. The Colemans eat out at Pei-Pei's Chinese restaurant, where Anna begs Tess to let her go to the audition with her band. Tess refuses since the show is on the same Friday as the rehearsal dinner for her wedding. They begin arguing again until Pei-Pei's mother interrupts to give them fortune cookies. The next morning, they wake up in each other's bodies, but cannot go directly back to the restaurant as Anna (now Tess) has school and Tess (now Anna) has her therapy patients. At school, Tess finds out that Anna was right about Stacey and Mr. Bates, beginning to understand her daughter's woes. Before Anna goes to Tess' office, she gives Tess' body a makeover, much to her mother's dismay. At the office, Anna has some difficulty handling her patients apart from a mother who has concerns over her daughter. At lunchtime, they go back to the restaurant to confront Pei-Pei and her mother, but she explains that only showing selfless love to one another will result in a reverse of the switch. In the afternoon, Anna attends Harry's parent-teacher conference, where she reads a composition about how much he actually admires her. Tess attempts to make amends with Stacey, but Stacey frames her for cheating. Jake helps her finish the test, which makes her realize that she has misjudged him. Unfortunately, he is no longer enamored with "Anna" after Tess sabotages Stacey's test in revenge. Meanwhile, Ryan surprises Anna with a talk show interview to discuss Tess' new psychology book. Tess and Jake watch the interview on television and while she is embarrassed, he is impressed. Later, Anna bumps into him at a coffee shop, and they bond over their favorite music. At the rehearsal dinner, Anna's bandmates come to try to convince "Anna" to sneak off to the audition, but they are caught by security. Ryan surprises Tess and Anna by giving "Anna" permission to go. He explains that he just wants the kids to accept him, and he urges "Tess" to go support the band, finally winning her over. Since Tess cannot play, Anna unplugs her guitar and plays while Tess plays air guitar. Tess also realizes how fun music is, and promises to treat Anna's band with more respect. Back at the rehearsal dinner, Tess tells Anna to ask Ryan to postpone the wedding, so that Anna will not have to go through marrying him in Tess' body. Instead, she proposes a toast where she finally accepts him because of how happy he makes Tess. This act of selfless love causes her and Tess' bodies to be switched back. Tess and Ryan later marry, she and Anna finally make up after such long conflict between them, and Anna and Jake start dating with Tess' approval. Anna's band even plays at the reception. The film ends after Pei-Pei's mother attempts to give Harry and Grandpa Alan the body switching fortune cookies when they argue, but her daughter confiscates them in the nick of time by tackling them to the ground. The film's producer Andrew Gunn said he initially hoped Jodie Foster (who played Annabel in the original Freaky Friday film of 1976) would be interested in playing the mother in the remake. She declined in order to spend more time with her family, and because of concerns that the stunt casting would overshadow the film's overall merit. Annette Bening was then cast in the role, but dropped out because of family obligations. Jamie Lee Curtis was given the role only four days before filming began. Lindsay Lohan's character was originally written as a Goth, but she did not think anyone would relate to that, and decided to dress in a preppy style for her audition. The character ended up being rewritten. Marc McClure, who played Boris Harris, Annabel's love interest in the original film, has a brief cameo as Boris the delivery man. Director Mark Waters also makes a cameo holding a baby at the wedding. In the end, scene when Anna is dancing with Jake, there is a woman in the background dancing with an older gentleman, and she looks directly at the camera. That is Lindsay Lohan's mother, Dina Lohan. Ryan Shuck coached Jamie Lee Curtis to play the guitar solo for the concert scene. Lohan trained for one year to learn to play the guitar before production. In the final version of the film, however, both Curtis and Lohan were overdubbed by professional studio musicians. The snapshots in the opening credits are photos of Jamie Lee Curtis and her daughter, Annie Guest. Kelly Osbourne was originally set to play Maddie, but dropped out because she did not want to do a children's movie. She was replaced by Christina Vidal. Principal photography began on October 5, 2002, and it ended on December 18, 2002. The film was released on DVD and VHS on December 16, 2003, by Walt Disney Home Video. It is now also available on Blu-Ray disc, which was released on September 11, 2012. In its opening weekend, the film grossed $22.2 million in 2,954 theaters, finishing second at the box office, behind S.W.A.T. ($37.1 million). The film went on to gross $110.2 million in North America and $50.6 million in other territories for a total of $160.8 million. The film was released in the United Kingdom on December 19, 2003, and opened on #4. Freaky Friday received positive reviews from critics. On Rotten Tomatoes the film has an approval rating of 88%, based on 150 reviews, with an average rating of 7/10. The site's critical consensus reads, "Jamie Lee Curtis and Lindsay Lohan charm in Mark Waters' nicely pitched -- and Disney's second -- remake of the 1976 hit." On Metacritic the film has a score of 70 out of 100, based on 36 critics, indicating "generally favorable reviews". Jamie Lee Curtis's performance was singled out for praise by many critics. David Ansen of Newsweek noted that, "the most startling metamorphosis is Curtis' transformation from fading horror flick queen to dazzling comedienne. She goes on a teenage tear—tormenting Anna's younger brother (who wonders why Mom's acting so weird), getting down and dirty on a TV talk show where Tess is supposed to discuss her book on aging—with fiercely funny conviction." Lisa Schwarzbaum from Entertainment Weekly called her performance "glorious," and A. O. Scott from The New York Times contended that she "does some of her best work ever [in Freaky Friday]." Nick Davis described her as "so frisky and pouty and incandescent in Freaky Friday, she made the whole movie feel like something special." Her performance was nominated for the Golden Globe Award for Best Actress – Motion Picture Musical or Comedy. Lohan's performance was also praised. Roger Ebert wrote that she "has that Jodie Foster sort of seriousness and intent focus beneath her teenage persona." The film earned her the award for Breakthrough Performance at the 2004 MTV Movie Awards. Nick Schager of Slant Magazine, however, objected to the body switching scene, calling it "a strange bit of 'Oriental mysticism' stereotyping that seems at odds with the film’s thematic focus on tolerance and understanding." The orchestral score was written by Rolfe Kent and orchestrated by Tony Blondal. List awards to film and actress/actors. ^ a b c "Freaky Friday (2003)". Box Office Mojo. Retrieved July 27, 2011. ^ a b Kuklenski, Valerie (August 13, 2003). "Disney's the King of Remakes". The Ledger. Retrieved November 30, 2014. ^ Gritten, David (December 20, 2003). "I'm still here". The Daily Telegraph. Retrieved November 30, 2014. ^ Peretz, Yevgenia (Feb 2006). "Confessions of a Teenage Movie Queen". Vanity Fair. Condé Nast (546): 120. ISSN 0733-8899. Retrieved September 3, 2008. As the script was written, the character was Goth, Lohan recalls: "No one could relate to the character when she was really Goth. There was nothing there." She took it upon herself to change it – before the audition. "I dressed really preppy," she says. "I wore a collared turquoise Abercrombie and Fitch shirt and khaki pants, swear to God, with a white headband. And my hair was really straight and pretty and red and blond. My agent calls and was like, 'What are you doing?!'" The studio ended up rewriting the character entirely. ^ "Kelly Osbourne Won't Get 'Freaky'". Billboard. September 12, 2002. Retrieved November 30, 2014. ^ "UK Weekend Box Office 19th December 2003 - 21st December 2003". www.25thframe.co.uk. Retrieved 30 January 2019. ^ "Freaky Friday (2003)". Rotten Tomatoes. Retrieved 27 June 2018. ^ Newsweek. "MOM IS TEEN FOR A DAY". Retrieved August 18, 2003. ^ Schwarzbaum, Lisa (July 31, 2003). "Freaky Friday (2003)". Entertainment Weekly. Retrieved November 30, 2014. ^ Scott, A. O. (August 6, 2003). "Film Review; Walking in Mom's Shoes With Mom's Feet, Too". The New York Times. Retrieved November 30, 2014. ^ Schager, Nick. Slant Magazine (Aug. 2, 2003).